Here we have a superb example of a gentleman’s 18ct vintage Rolex Oyster Perpetual ‘Date’ dress watch from 1978. The watch has a Silver-White starburst dial which is original and unrestored and in tip-top condition. The 35mm, 18ct yellow gold case has the sought after plain bezel and the whole case is in immaculate condition. This is Rolex model reference 1500, with the Rolex Cal. 1570, 26 Jewel, Certified Superlative Chronometer Grade (highly accurate and highly reliable) automatic movement, which has just received a full overhaul and service. This watch will make a wonderful 40th birthday present or 40th anniversary watch as this watch was manufactured in 1978 making it 40 years old this year. For more details, please see ‘The Case’ below. The stunning Silver-White starburst dial is the classic Rolex Oyster Perpetual dial with baton hour indices and ‘stick’ hands. The dial carries the perennial Rolex Coronet at 12 and a date function with the ‘Cyclops’ bubble. It is signed ‘Rolex Oyster Perpetual Date’ and ‘Superlative Chronometer Officially Certified’. Usually, we restore the dials of all our watches as part of the overall watch restoration, but this dial is original and unrestored and it is in tip-top condition – far too good to restore. The watch carries its original very high grade ‘Superlative Chronometer’ Calibre 1570, 26 jewel automatic movement which is in sparkling clean condition. The movement has been completely overhauled and serviced which involves fully dismantling, ultrasonic cleaning, inspection under high magnification and replacement of parts, only with new original Rolex parts where required. Then careful reassembly and oiling ready for testing and calibration. The watch is now running perfectly, having been calibrated and timed within 0.5 sec0nds per day. Please note this is truly outstanding for any watch of this age and this has been confirmed by our electronic time-grapher. It is therefore ready for many more years of faithful service. The movement is all correctly signed ‘MONTRES ROLEX SA GENEVA’, ‘SWISS’, and ‘TWENTY SIX JEWELS’ with the Calibre number 1570. It also carries the reference number DS95786. These movements are very strong, very accurate and very reliable! This particular movement is in superb A1 condition and with regular servicing, say every 3 to 4 years, we would fully expect this watch to run happily for many years to come. We are therefore pleased to offer a 12 months warranty on this watch movement*. The 18ct yellow gold case measures 35mm in diameter, not including the original Rolex Oyster screw-down crown. The case carries the sought after plain bezel as opposed to the usual fluted bezel and the bezel case and case-back are all in superb condition with no marks or scratches visible to the naked eye as the watch has seen only very light use and has been very well cared for. Following close inspection, it has simply required some gentle hand-polishing to bring the watch to almost new condition once more. The outside of the case back, importantly, has never been engraved and equally importantly, it is of its original thickness. Inside the case-back, the markings are all correct for a Rolex, Geneva, Swiss made case and it is signed MONTRES ROLEX S.A, GENEVA SWITZERLAND, R.W.C. LTD with the correct Swiss hallmarks for 18ct gold, along with the model number 1500. The model number can also be clearly found on the outside of the case between the lugs at 12 o’clock and the case serial number 5,657,043 is found on the outside of the case between the lugs at 6 o’clock. This dates the watch to 1978. The case has the screw-down Rolex Oyster crown and screw-down case-back, each complete with new rubber seals, however although the watch was specified as waterproof when new, this has not been tested and it is not guaranteed. As always, our standard advice applies: Vintage watches should be kept clean and dry at all times. A very high quality Brown Crocodile strap has been fitted, along with a matching gold plated Rolex buckle. However, if a different colour or style of strap is preferred, please let us know and we will do our best to oblige free of charge. We carry tan, conker, dark brown and black in stock in plain padded leather, crocodile skin or lizard skin. We can also obtain most types and colours from our partners at ‘Watch Obsession’ within 48hrs. Please take a look at their huge range of 19mm straps if you wish here. Although there are are no original papers with this watch, the reference numbers, markings, signatures and hallmarks are all correct, dating this watch to 1978. Detailed particulars will be included with the receipt, along with our 12 months Warranty*. A separate insurance valuation for the replacement value of this watch will be provided at the time of sale along with our unique ‘Lifetime Authenticity Guarantee’ which states: “If this watch proves to be anything less than totally authentic, or not as described, Vintage Gold Watches of London will offer you a full refund at any time”. 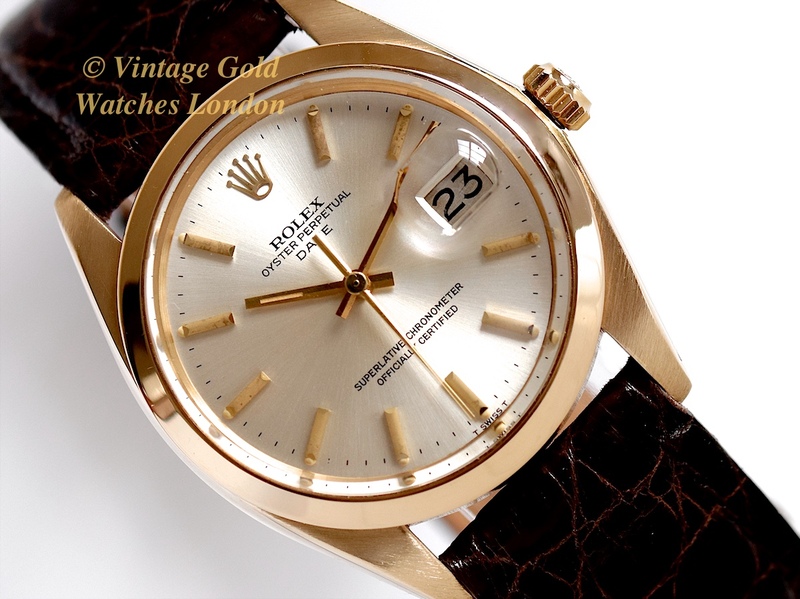 This is a truly first class example of a classic late 70’s vintage 18ct Rolex Oyster Perpetual ‘Date’. This watch is ready to wear and completely practical for everyday use. If treated with care, it will make an excellent investment or heirloom piece and even though vintage gold Rolex prices have risen markedly recently, we still feel good examples such as this are still undervalued. As each year goes by and the world market for vintage gold Rolex watches continues to expand, prices will continue to climb ever higher. It is a highly collectable vintage watch from horology’s most famous name, which is ready to wear, use, treasure and enjoy. It will provide excellent reliability and a sound financial investment, as long-lasting as the watch itself! Please note we welcome part exchanges. If you have a watch or small collection for sale, please contact us as we will be happy to discuss.